In light of the Digital Health Days held in Stockholm on the 23rd-24th of September, eGovlab at Stockholm University brilliantly engaged with e-health industry experts through a hands-on workshop and presentation. eGovlab invited participants to share ideas on the future of e-health in Europe and forecast new technologies (cloud, IoT, Open Data) that will fulfil the increasing need for "Cross-border e-health services". The workshop focused on implementing a patient-centric approach in cross border e-health services to improve today's European healthcare system. The topic sparked further discussions among the participants raising further issues on patient privacy, trust and data sharing. 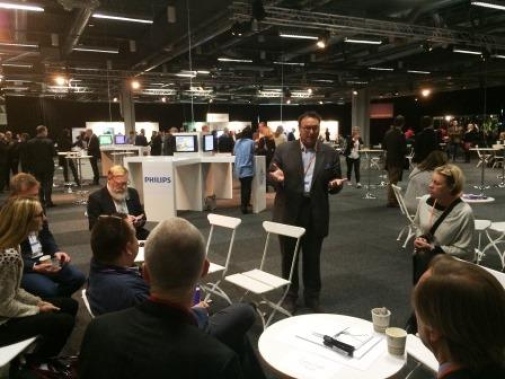 eGovlabs Director Vasilis Koulolias at Digital Health Days in Stockholm.